Here are some easy tips for how to grow Centaurea plants: In average, well-drained soil, dig a hole twice the size of the pot. The top of the root ball should be level with the soil. Fill in the hole and tamp down to prevent air pockets. Water well. 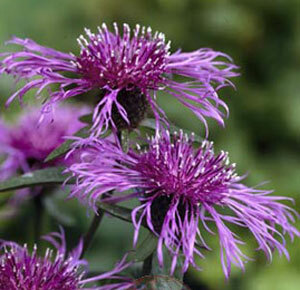 If planting multiple Centaurea plants, space them 3 ft. apart. Description: These easy-to-maintain perennial plants grow naturally in meadows or pastures. They have hardy grey-green foliage (often spiky) and showy, thistle-like flowers. The blooms range in solid or mixed colors of intense blues to reds, yellows, and white. Propagation: By seed. Centaurea plants self-seed easily. 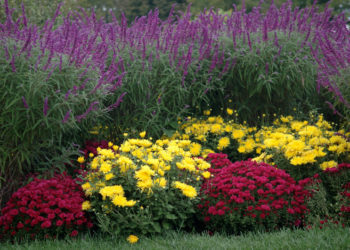 Fertilizer Needs: Knapweed plants generally need no fertilizing. Maintenance: Prune by 1/3 after bloom. Divide roots every couple of years. Herbal/Medicinal Uses: Both the roots and the greens of these perennial plants are eaten and also used in folk medicine. Laboratory tests show Knapweed plants have anti-cancer properties.